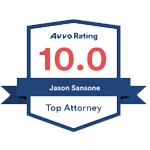 Mr. Jason Sansone is the founder and a principal attorney at Sansone Howell. His practice focuses primarily on bankruptcy law where has helped countless numbers of people file bankruptcy, litigated adversary proceedings, and guided businesses through both restructuring and liquidation. Mr. Sansone was selected to the 2014, 2017, and 2018 Super Lawyers Oklahoma Rising Stars list for Bankruptcy. Each year, no more than 2.5 percent of the lawyers in the state are selected to receive this honor. Prior to Sansone Howell, Mr. Sansone served as General Counsel and Corporate Compliance Officer for National Credit Solutions. In addition, Jason has previously worked with the National Basketball Association, Minor League Baseball, and Six Flags Over Texas. Jason is admitted to practice in all Oklahoma state, federal, and bankruptcy courts, the United States District Court for the Northern District of Texas, the United States District Court for the Eastern District of Texas, and the Tenth Circuit Court of Appeals. He is a member of the Oklahoma Bar Association, Robert J. Turner American Inn of Court, a Rotary Paul Harris Fellow, and the Del City Chamber of Commerce. Jason previously campaigned for the Oklahoma House of Representatives for District 94. Jason holds a Bachelor in Business Administration from the University of Oklahoma, Master of Business Administration with High Honors from Oklahoma City University, and Juris Doctor from Southern Methodist University Dedman School of Law. While in law school, he served as Vice President of the Student Bar Association (SBA), was a two-term member of the SMU Student Senate, and Dean’s Scholarship Recipient. In addition, Mr. Sansone interned with the Dallas County District Attorney’s Office Family Violence Division and with the 44th State Civil District Court.